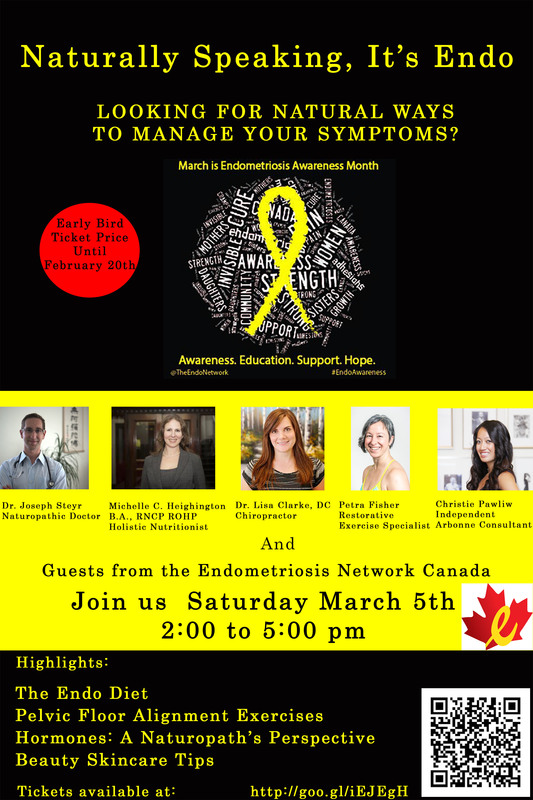 March is Endometriois Awareness Month and if you have questions about Endo, or are looking for natural ways to manage your Endo symptoms, then this is the workshop for you! We are hosting a fun and interactive event about natural options for Endometriosis. Join us for light snacks and an afternoon of engaging guest presenters who will share with you their best methods for managing Endo symptoms. We will also be having a make-up tutorial that’s sure to leave you glowing! Nutritionist Michelle Heighington, Naturopathic Dr. Joseph Steyr, Chiropractor Dr. Lisa Clarke, Restorative Exercise Specialist Petra Fisher, and Independent Consultant for Arbonne Christie Pawliw will share with you their extensive knowledge and best tips. We will also be holding door prizes at the end of the workshop.